This Persistence Market Research report examines the ‘Global Deodorant & Antiperspirant Ingredients Market’ for the period 2015-2021. The primary objective of the report is to offer updates on the advancements in the deodorant and antiperspirant ingredients industry, examine new products and business strategies undertaken by the various manufacturing companies, which are significantly transforming the global market. This study analyses, estimates, and forecasts volume (MT) and value (US$) from the demand as well as supply perspective for the forecast period 2015–2021. The report also highlights the impact of various drivers and restraints in various regions, along with their impact during the forecast period. The report starts with an overview of deodorant and antiperspirant market and is categorically split on the basis of product type, Ingredients, and geographies. Furthermore, the report covers the global deodorant and antiperspirant ingredients market performance in terms of value and volume based on each ingredient type, product type, region type, as well as key countries in this region. Impact analysis of key growth drivers and restraints, based on the weighted average model is included in the report to better equip and arms clients with crystal clear decision-making insights. Demand for deodorant and antiperspirant products is increasing significantly, especially among youngsters. Exponential growth in demand for deodorant and antiperspirant product by female consumers has been reported over the past few years, and it has also been observed that deodorant is one of the top five products used in daily grooming routines by female consumers. Moreover, premium quality ingredients, attractive designs, and packaging are further driving deodorant and antiperspirant sales, thus driving demand for ingredients. Due to these factors, deodorant and antiperspirant ingredients are expected to reflect a significant increase in demand in the near future. Five major types of deodorant and antiperspirant product types covered in this report include aerosol, roll-on, creams & wipes, and sticks & solids. By deodorant product type, the market is segmented into aerosol deodorants, roll-on deodorants, creams & wipes deodorants, sticks & solids deodorants, and others. Among these segments, aerosol deodorant is projected to account for 75.3% share of the overall market by 2021. By antiperspirant product type, the market is segmented into aerosol antiperspirant, roll on antiperspirant, sticks & solids antiperspirant and others. The aerosol antiperspirant segment is largest in terms of market value and is expected to register highest CAGR of 4.4% between 2015 and 2021 owing to its easy to use characteristic. 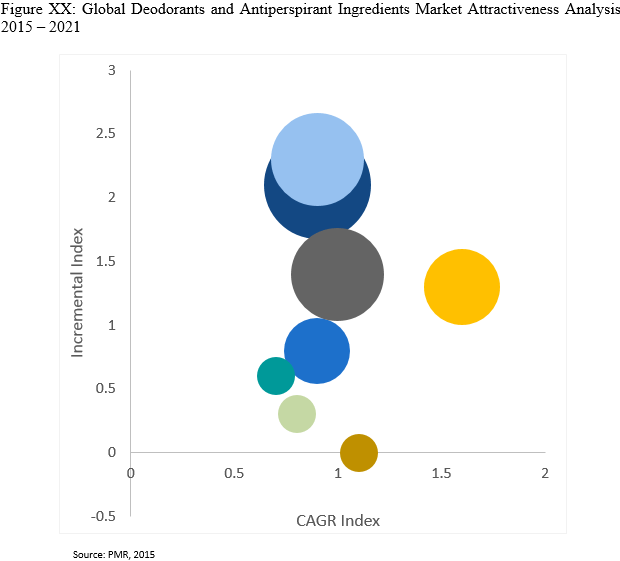 Considering the Ingredients aspect, the global deodorant and antiperspirant market is segmented into alcohol, aluminum, antimicrobials, base/ carrier substances, conditioner & moisturizer, fragrances, parabens & propellants, and others. Among the aforementioned segments, alcohol ingredient segment is expected to dominate the global market with over 35% revenue share throughout the forecast period. Alcohol ingredient accounted for US$ 427.0 Mn in 2014 and is anticipated to reach a value of US$ 662 Mn by 2021 at a CAGR of 6.5%. Increasing demand for deodorant and antiperspirant products with long lasting protection, fragrance, and effective antibacterial activity is expected to further propel the demand for this ingredient. On the basis of region, Europe dominated the global deodorant and antiperspirant ingredients market in 2014 in terms of revenue contribution, followed by North America and Asia-Pacific. Europe is expected to continue its dominance with over 30% revenue share throughout the forecast period. The report provides market revenue and volume for each application segment under each geographical segment, as well as a country segment. The global deodorant and antiperspirant market in terms of regions, application and product type are analysed in terms of Basis Point Share to understand relative contribution by individual segments to market growth. This detailed level of information is important for identifying various key trends of the global deodorant and antiperspirant ingredients market. All the above sections, by product type, ingredients, and geography provide the present scenario and the growth prospects of the global deodorant and antiperspirant ingredients market for the period 2015 to 2021. Given the characteristics of the market, we triangulated the outcome of three different types of analyses, based on the supply side, consumer spending, and economic envelope. In addition, it is imperative to note that in an ever-fluctuating global economy, we not only conduct forecasts in terms of CAGR but also analyse on the basis of key parameters such as year-on-year (Y-o-Y) growth to understand the predictability of the market and to identify the right opportunities across the global market. Furthermore, to understand key growth segments in terms of growth of deodorant and antiperspirant ingredients, Persistence Market Research has developed a Market Attractiveness Index on the basis of product type, ingredients, and geography. The resulting index should help to identify real market opportunities. The final section of the report includes competitive landscape, which provides report audiences a dashboard view, based on various segments, the presence of various players in the global deodorant and antiperspirant market, and key differentiators. This section is primarily designed to provide clients with an objective & detailed comparative assessment of key providers specific to a market segment in the global deodorant and antiperspirant value chain. Detailed profiles of companies are also included in the scope of the report to evaluate their operations, expansions, products, and sales channel strategies. Antimicrobials and fragrances used in deodorants help to reduce unpleasant body odor caused due to a growth of microbes; whereas antiperspirants are used to reduce perspiration through the use of pore-blocking agents such as aluminum or other alternatives. The increase in per capita disposable income among consumers across the globe and particularly in developing markets is resulting in increasing demand for deodorant and antiperspirant products on a year-over-year basis. Furthermore, deodorants and antiperspirants are among the fastest growing products in terms of volume demand amongst the various personal care products. The annual average growth rate of these products in terms of volume has increased by over 5% between 2010 and 2015. The surge in demand for deodorants and antiperspirants has catalyzed the deodorant and antiperspirant ingredients market. Over 20 different ingredients are used to manufacture deodorants and antiperspirants, of which the prominent ingredients include alcohol, conditioner and moisturizers, base and carrier substances, paraben and propellants, fragrances, antimicrobials, and aluminum. The global deodorant and antiperspirant ingredients market is estimated to account for US$ 1,619 million in 2015, which is expected to increase to US$ 2,390 million by 2021, registering a CAGR of 6.7% over the forecast period. Among all the ingredients, alcohol is estimated to account for the largest share in terms of value, accounting for approximately 28% of the global deodorant and antiperspirant in 2015. Moreover, in terms of growth rate during the forecast period, fragrances as an ingredient in deodorants and antiperspirants is projected to reflect highest CAGR of over 10%. The antimicrobials ingredient segment has registered a 7% CAGR in the past seven years, which is expected to surpass 8% post-2017, indicating a shift in the usage of antimicrobials in deodorants and antiperspirants. Concerns among consumers regarding the use of aluminum in antiperspirants is hampering preference and demand for generic antiperspirants products. Aluminum salt is one of the key Ingredients used in antiperspirants as it inhibits sweating, thus restraining bacterial growth and body odor. Usage of antiperspirants that contain aluminum salt leads to deposition of aluminum salts over pores of the skin, which could be harmful to a certain extent. Moreover, growing awareness regarding health and safety among consumers globally could restrain demand for such antiperspirants in the near future. Keeping in mind the associated risk of skin damage and diseases such as cancer due to a usage of aluminum and alcohol, companies are currently reducing the use of these ingredients in antiperspirants and opting for other alternatives such as caffeine, sodium bicarbonate, and aluminum potassium sulphate. A detailed analysis of attractiveness in each ingredient type has been highlighted in the report. Key market participants profiled in the report include Unilever Company, Procter & Gamble, L’Oreal Company, Avon Product Inc., Shiseido, CavinKare Pvt. Ltd., Henkel AG & Company KGaA, Beiersdorf AG, Godrej Consumer Products Ltd.
Henkel AG & Company KGaA.